A beautiful pocket townhouse in the heart of what has been called 'the most stylish town in the Cotswold's' has a delightful sitting room room with antique surround open fire, a pretty kitchen dining room – seating four - with wood hand-painted kitchen, a south east facing courtyard garden, two very stylish double bedrooms - one with en-suite shower room and family bathroom with shower. Located just off Long Street it is a very central location to enjoy Tetbury's charms; which you can see on our 360˚ tour of Tetbury. A beautiful pocket townhouse in the heart of what has been called ‘the most stylish town in the Cotswold’s’ has a delightful sitting room room with antique surround open fire, a pretty kitchen dining room – seating four – with wood hand-painted kitchen, a south east facing courtyard garden, two very stylish double bedrooms – one with en-suite shower room and family bathroom with shower. Located just off Long Street it is a very central location to enjoy Tetbury’s charms; which you can see on our 360˚ tour of Tetbury. A beautiful bijou townhouse in the heart of the most stylish town in the Cotswolds has a delightful sitting room room with antique surround open fire flanked by book shelves and interesting pictures and prints throughout; with a games cupboard to keep you busy during winter nights in front of the fire and TV with Freeview, comfortable sofa and softly lit lamps and Sanderson fabric bespoke curtains give this room a lovely relaxed feel. The pretty kitchen dining room – seating four – is wood hand-painted kitchen with single oven, extractor and gas hob, Iroko worktops, ceramic sink and stylish fixtures and fittings – a lovely place to cook and relax. A scrub top table seats four adjacent to hand-made bespoke “Doggy” print linen blinds with utility cupboard off containing boiler, washer dryer, microwave. French door lead onto the south east facing courtyard garden, a simple but pretty space to relax. The stairwell is off the sitting room and is a lovely feature with wide-width Lewis & Wood wallpaper giving the feel of an original wall painting. Off the first floor landing is the main bathroom with bath and over period rose head shower. Limestone tiles, a bespoke marble vanity unit painted in Farrow & Ball “Blue Gray” and LED lighting give this room a very cosy ambiance and comes with its own mini library to while away the time. 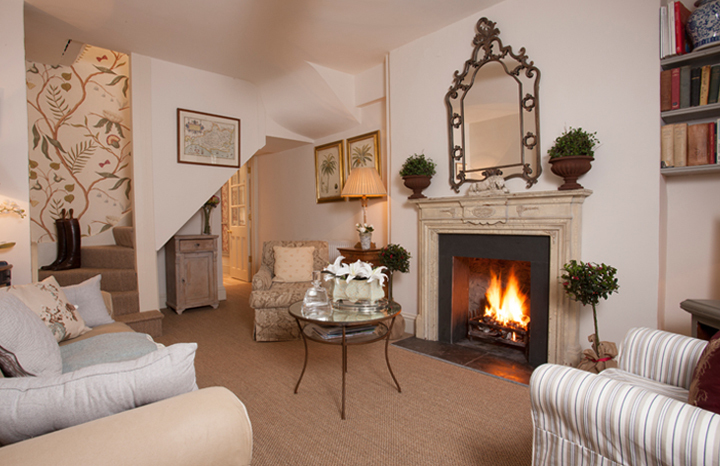 The first floor bedroom has a stylish French theme with toile and ticking fabrics and sisal flooring, a hand painted wardrobe, vintage upholstered bench seat with the Freeview television discretely hidden in the corner. The tall sash window gives plenty of natural light and the French painted antique bed boasts a pretty canopy with Manuel Canovas fabric drapes. The second floor vaulted master bedroom is off the very ‘characterful’ staircase and boasts a stunning French Empire style king bed and mahogany dressing table and has its own limestone tiled en-suite shower room. One well behaved dog is very welcome and a travel cot and high chair can be provided upon request.